As parents, our priority is a safe and happy start for our children. From even the first week of a new life, we strive to teach a newborn about self-soothing! Therefore, a safe and reliable self-soothing tool is key. Enter the WubbaNub, a trusted nursery essential that combines the soothing properties of a pacifier with the warmth of a lovey. The adorable, intelligent invention was designed for even the smallest hands to grasp, and may assist in strengthening fine motor skills. 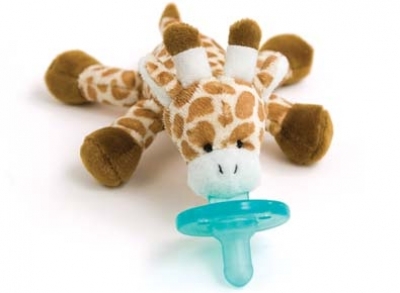 It has also been designed to lend peace of mind to parents thanks to a secure, plush animal attachment and BPA-free, medical-grade silicone pacifier. A cinch to clean and find, ‘Wubs’ are ideal for use from birth to the first signs of teething and ultimately become an early best friend a child will bond with and adore. Beginning its 18th year of business, WubbaNub continues to wow parents, pediatricians and hospitals everywhere. Super-popular classic animal friends include Giraffe, Puppy and Green Frog, while new limited-edition styles, Birthday Bichon, Moose and Monster are now available. Beloved Panda will also become a “regular.” You simply can’t go wrong; the cuteness factor for all picks is off the charts. Carla Schneider, ingenious mompreneur, invented the WubbaNub on a whim, in a moment of panic. While on the first trip with her newborn son, Schneider noticed he was constantly losing his pacifier and having difficulty keeping it in his mouth. She needed to calm him down quickly, so she sewed a basic pacifier to a stuffed animal. He immediately accepted and loved his new sidekick. Visit www.wubbanub.com to choose from a variety of animal friends that promise to aid in a sweet beginning with lots of smiles.